When I express my profound distaste for the music of Chopin to the man who, not without justification, claims to be "probably Singapore's most rabid pianophile and pianomaniac", Chang Tou Liang, he is rendered almost speechless (and if you follow the link to his action-packed Pianomania blog, you'll find ample evidence of his piano passion). He is equally incredulous when I utter disparaging words about Liszt. But I've noticed that fans of the piano tend to regard both composers as demi-gods, so I can appreciate the horror they feel when they hear such blasphemy. I certainly don't deny that both were important and influential composers and that without them the subsequent course of musical history would have been very different. I just can't stand their music. My dislike of Chopin was considerably increased by the excesses of the bicentenary year. Hardly a day went by without being subjected to one of those hideous, self-indulgent and painfully affected Nocturnes, Waltzes, Mazurkas or Polonaises, and as for the two dreadful piano concertos, Chopin's musical imagination barely sustains their moderate length, it certainly doesn't sustain the levels of repeated hearings both were subjected to during 2010. The trouble is, of course, Chopin didn't really compose anything else. He never once in his output gave the piano a miss; which is a shame because I confess to rather liking the orchestrated versions of his piano pieces in Les Sylphides; my preference being, somewhat perversely, for the Roy Douglas orchestrations over Glazunov's. (One of the versions – I can't tell you which – is being performed by the Malaysian Philharmonic Youth Orchestra in Kuala Lumpur on 18th March, so Chopin fans should book their tickets now – especially since you'll also get a chance to hear the inimitable Paul Philbert in Panufnik's excellent Concertino for Timpani, Percussion and Strings.) He did, however, write a handful of chamber works, and I vaguely recall a performance of the Cello Sonata whilst at university; if my memory serves me correctly (which I doubt), it was little more than another dreary piano solo with occasional irrelevant and unnecessary interjections from the cello, but I do recall that I rather liked it. Chopin also wrote some songs, but through the whole of 2010, at least here in southeast Asia, all we had was back-to-back piano solo music. A total waste of a bicentenary! Surely that's an excuse, if ever there was one, for resurrecting the works which do not usually get to be heard in public. 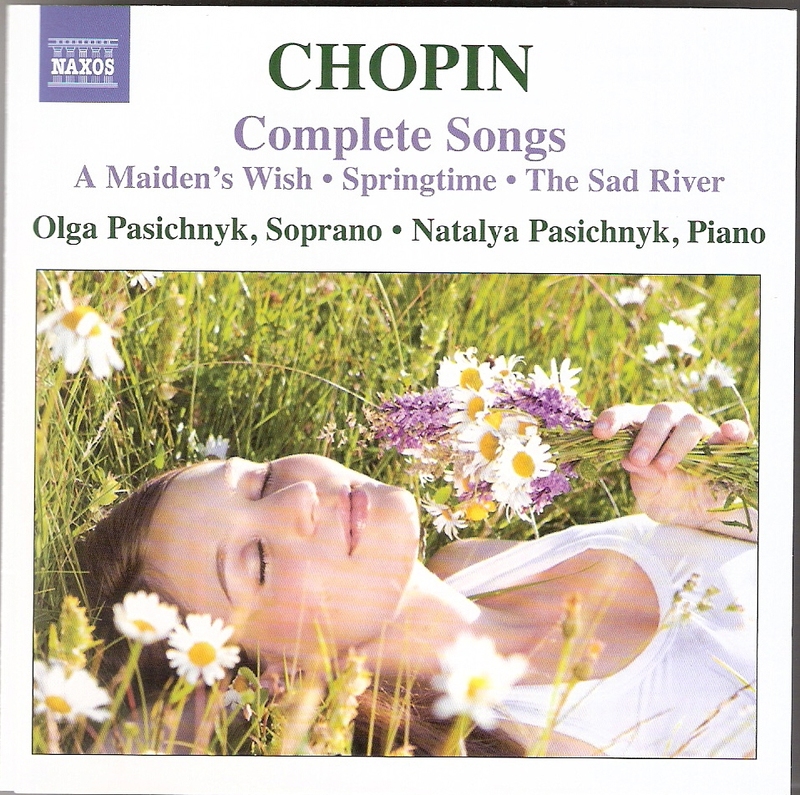 By chance, however, returning to the UK for the first time for several months, I found waiting for me among a huge box of CDs for consideration, one devoted to Chopin's songs. Intrigued, I sat down and listened to it straight away and have to say it gave me rather a lot of pleasure. I was a bit perplexed by the fact that the "Complete Songs" amounted to 23 – all the reference books seem pretty fixed on the number 19 – but then I realised four of them were the Pauline Viardot arrangements of four of the Mazurkas (arrangements which Chopin himself was not entirely complimentary about, and I don't blame him given the dreadfully silly Aime-moi), but with the Op.74 songs as well as the two without opus numbers, we get authentic Chopin songs, sung in their original Polish (mostly written around the time he went into exile and, therefore, expressing powerful feelings of nostalgia for Poland). The four Viardot songs are in French. The disc doesn't feature a genuine Polish soprano – Olga Pasichnyk is Ukrainian, although she did study in Warsaw and was a member of the Warsaw Chamber Opera – but she has a real feel for the idiom (listen to the haunting quality she brings to the magical unaccompanied phrases of Špiew z mogily) and, greatly aided by the uncannily perceptive partnership she has with her pianist sister Natalya, those songs which are little more than piano solos with optional voice (Žyczenie and Wojak being the most blatant examples) come across compellingly, while the truly integrated songs – perhaps Moja pieszczotka is the finest example – vie almost with some of the Schumann songs of the same period. 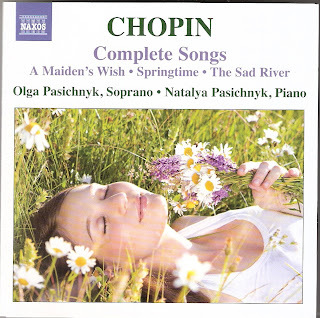 Most effective of all are those songs where the piano adds colour but leaves the musical meat to the singer (Wiosna and the almost Grieg-like Poseł) and in these the excellent Pasichnyk sisters provide a real glimpse of what might have been had Chopin ever been able to tear himself away from the piano even for a single opus number. For all its poetic potential and self-sustainability, the piano is still a very limited musical instrument, and in these songs Chopin's vocabulary just seems to take on wholly new dimensions. You can hear in the tragic poise of, say, Melodia, echoes of some of the great piano pieces, but how the perspective is enlarged and opened up simply by the presence of a voice. Chopin has to write melodies which have shape and direction, and do not just survive on the charming pianistic effects he can create. When you think of it, Chopin should have been a natural writer for the human voice; he was happy to pour out oodles of expressiveness into his music (singers like to be expressive), he wore his emotions on his sleeve (singers like to do that too), he relished moments of high drama (what singer doesn't) and, although it can be overdone, his music cries out for the rhythmic freedom of rubato (and if there's one thing a singer hates it's being confined within a firm beat), and these songs show that he had it in him to be a magnificent song composer. How I wish he'd stuck at it. I might be less inclined to incur the disapprobation of Chang Tou Liang. Ha ha! You're probably a fan of Max Reger and Sigfrid Karg-Elert, aren't you? With their thousands of organ works! All the Pianomaniacs hereby apologise on behalf of their Polish Idol that he didn't write a single organ piece (out of 15 hours of music) to satisfy Dr Marc!!! By the way, do you happen to play organ transcriptions of Chopin? Are they any good? Here's an interesting postscript from http://www.concierto.org contributed by Benjamin K Roe. I need to check it out, but it sounds more than ikely. "You could even say that to this day the organ was closest to Chopin’s heart. Truly: as a teenager in Warsaw, Chopin played the organ at Holy Cross Church – the same church where today, Chopin’s heart is tucked away in a vial of cognac. First pillar; left hand side of the nave. Even after he left Warsaw, Chopin didn’t forget his organ roots. In 1839, he volunteered to play for the funeral in Marseilles of popular operatic tenor Adolphe Nourrit. George Sand was there to chronicle what happened: 'The congregation, which had come en masse exercising its curiosity to the extent of paying fifty centimes per seat... was disappointed, because they had expected Chopin to make a row that would bring the roof down, and at least break two or three organ-pipes'."